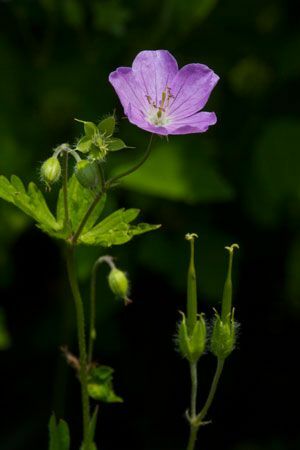 Cranesbill, also called spotted-geranium, grows in the forests of eastern North America. The First Nations People used this herb has a powerful astringent. The root contains an abundance of tannins. In general, astringent herbs form cross-linking with proteins to "tan" the injured tissues and produce a "second skin" that protects, hastens wound healing and prevents infection. Cranesbill is used whenever astringents are indicated to stop bleeding, heal wounds and reduce mucous discharges. Historically cranesbill was used for dysentery, diarrhea, and infantile cholera. Tannins have an antisecretory effect by inhibiting proteins (chlorine transporters CaCC) involved in diarrhea. Also, they reduce stomach acid by inactivating transporters (H/K-ATPase) involved in making HCl. Research on cranesbill is almost non-existent but based on tannin research, cranesbills traditional indications are plausible.